Today is National No Smoking Day! No Smoking Day is a yearly event to get smokers who want to quit started on the path to quitting for good. The aim of the campaign is for people to quit on No Smoking Day - even if it's just for that day - to prove to themselves that it is possible, and kickstart their desire to quit, and stay quit. The British Heart Foundation say: "Whether you're someone who's quit smoking and wants to inspire others, a healthcare professional or addiction specialist, an office worker, a school teacher, part of the armed forces or the prison service, we need you to help us make No Smoking Day a roaring success". Find out more on the British Heart Foundation No Smoking Day website here. If you are reading this thinking, "yes I want to stop but I'm not sure whether I can do it" or "I've been a smoker for such a long time, I just don't know if it's possible for me to quit" then consider having hypnotherapy to help you quit for good. Hypnotherapy is a great way to work with the power of your own mind to turn a habit around. So pick up the phone and call me on 01252 334377 or email me at Christy@christyhypnotherapy.com for a free telephone consultation. On Saturday 8th March I am delighted to announce that I will be giving a FREE workshop on Hypnotherapy at the Wellness Day event. During this workshop I will be talking discussing what hypnotherapy is (and isn't!) and dispelling some of the myths and misconceptions about hypnosis. I will also be doing a short demonstration, so if you've ever wondered what it's like to experience hypnotherapy, please come along! 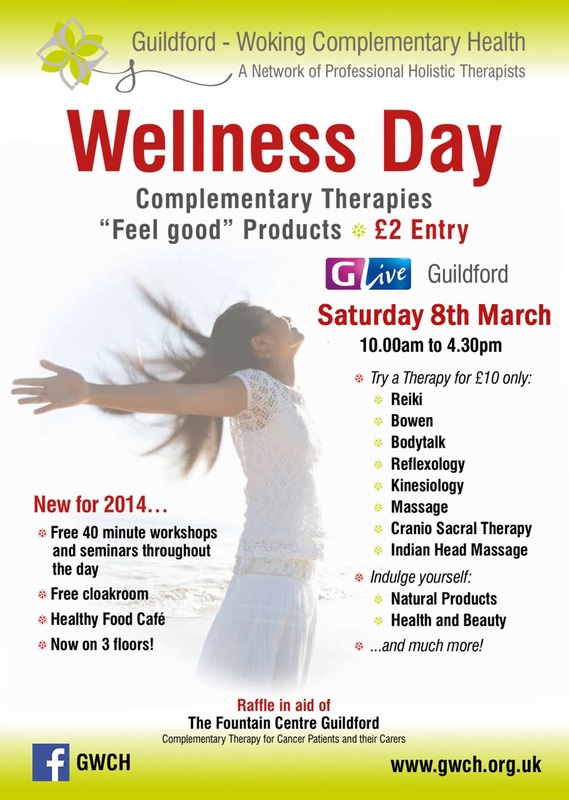 This Wellness Day is a fantastic event which has been held in Guildford for the past few years and has now grown to include over 40 stalls, with demonstrations of a wide range of therapies including Massage, Kinesiology, Bowen, Reflexology, Homeopathy and even Magnetic Jewelry. Throughout the day you will be able to meet and talk to a wide range of therapists, sample some healthy food in the cafe and even experience taster sessions.